Any book with a title like "Londonopolis" is a book that is guaranteed to grab my attention. I had high hopes for the slim little book by Martin Latham, but sadly, other than a few interesting tidbits, I was generally disappointed by the book. If you're like my husband, you may wonder why there are so many books constantly being published about London (and more to the point, why I own most of them), but the subject is so endlessly fascinating that each book seems to have something new to say, even on such a well covered topic. Londonopolis is divided into sections based on time frames such as "Ancient London," "Medieval London," all the way up to "Twentieth-Century London." There is one final chapter on The Secret Thames. 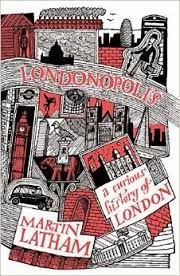 Each section is not just a straightforward history of London during the time mentioned, but rather contains an odd (in my mind) assortment of anecdotes and stories which I assume are meant to give an impression of the city at that particular time. However, since the stories don't seem to have a unifying theme (other than that they happened to take place during a vaguely similar time frame), the overall result is unsatisfying. For instance, in the chapter on Victorian London, there are stories about Big Ben's construction, Karl Marx's daughter, some of the scientists who worked at the Natural History Museum, a discussion of 6 artists who work working at this time, and a strange one-off ghost story featuring people you've never heard of (John Hernaman, anyone?). Nothing really ties the stories together or really gives you any sort of feel for the time period. The author is lucky enough to have grown up in London and so has a lot of personal memories of the city and people he encountered at various times, but even those stories aren't very interesting. Maybe his family or acquaintances would enjoy the recollections, but they seem too personal to be of much use or entertainment to the casual reader. If you feel that you've read everything there is to read about London, perhaps this book might have a few tidbits that would interest you. Otherwise, it's an odd collection of recitations about people and events that are of limited interest.